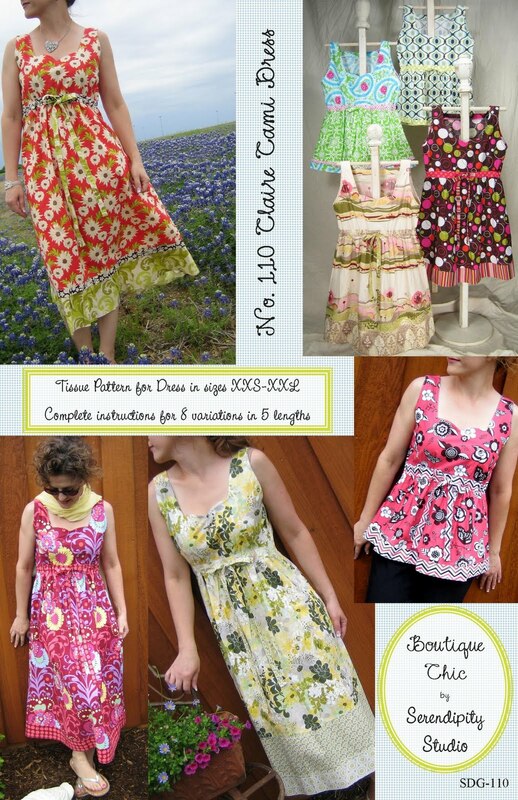 Sew Serendipity: Market Review and a GIVEAWAY!! It has been CRAZY around here since we got back from market over a week ago. My apologies for not getting this posted sooner, but I had patterns to stuff and orders to ship, so that had to come first. 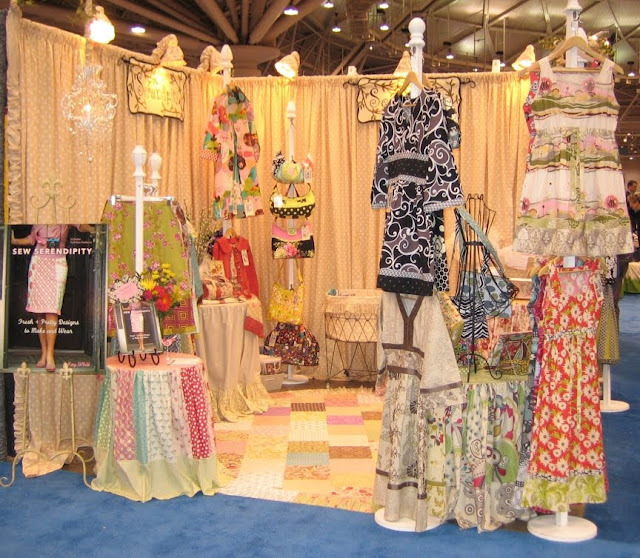 Now that I have that all completed, it is time to share the booth and other stuff with you from market. I know some photos are floating around on Facebook and other blogs, so some of this will be repeats of stuff you have seen somewhere else, but hang with me...there is some real goodness here at the end of the post! We had a great market. The response to the new designs was fantastic, not to mention how much everyone loves the book. We had two golden copies at market for preview. The photos on the blog here and at the website just aren't a proper substitute for holding the book in your hands and being able to experience it in person. What can I say? Krause did a beautiful job with the layout, photography, just everything about it is perfection! We are still on schedule for shipping at the end of the month, so those of you who have ordered...just hang in there...we'll get those books out as soon as we get them here! Day 1: I am wearing Monique in some luscious cotton from Rowan. These are some Phillip Jacobs prints with a bit of Kaffe Fassett thrown in (the dots)...this fabric is so soft that it feels like voile. It was just a dream to sew with and to wear. I am not normally drawn to vibrant yellows, but I LOVE this fabric! Day 2: I am wearing the Sophia Trench Coat with the Sabrina Tunic underneath. 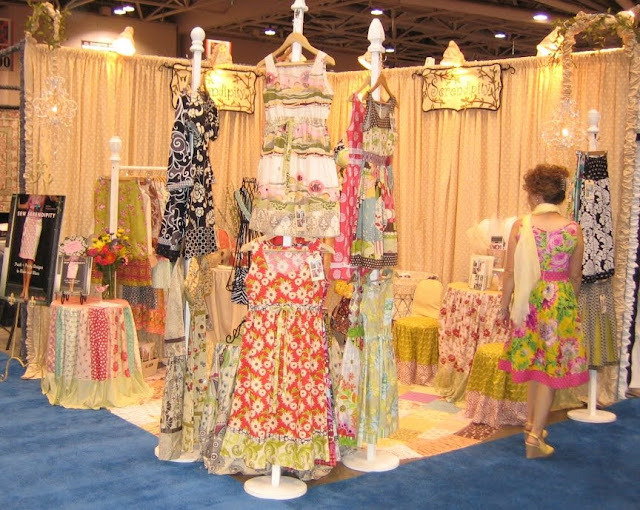 These are fabulous new fabrics from Moda that were shown at the show called "It's A Hoot". It was designed by MoMo and there are large stylized owls on the print as well as other great elements. I really love the colors and how the large scale print works with the trench coat design. It lets those fabrics really sing! Just an FYI, the coat is made entirely from twills in that line and the dress is made from the regular cottons. It drew a lot of attention and I have to say that I loved wearing it! Here I am with Gene Stewart from Moda (you can see him over on the right). We were recording a short video about my new designs and book for him to share with customers who couldn't make it to market. Day 3: I am wearing the Claire Cami Dress. 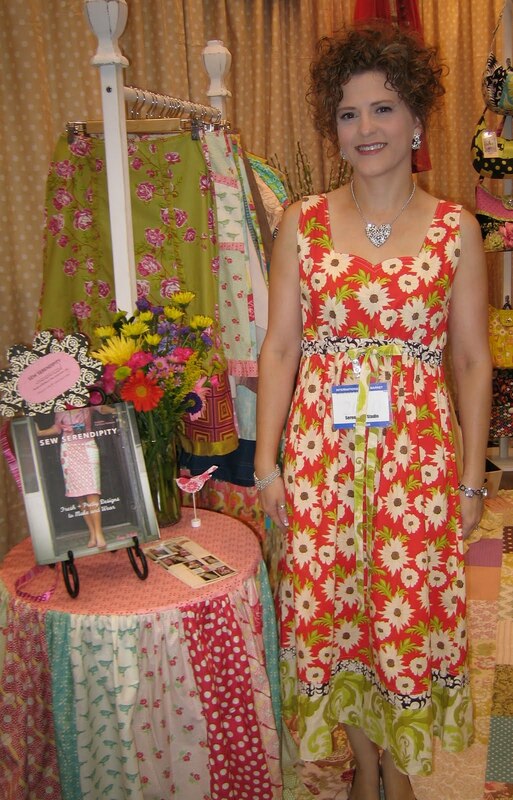 It was our most popular pattern at market...super simple to make and I must say the quintessential summer dress. This one is made from Sandi Henderson's Meadowsweet fabric with Michael Miller. I just love that fabric! We also had some sightings of my designs being worn by other vendors at market...which is always a treat. Here are the girls that were working in the Quilted Fish's booth. 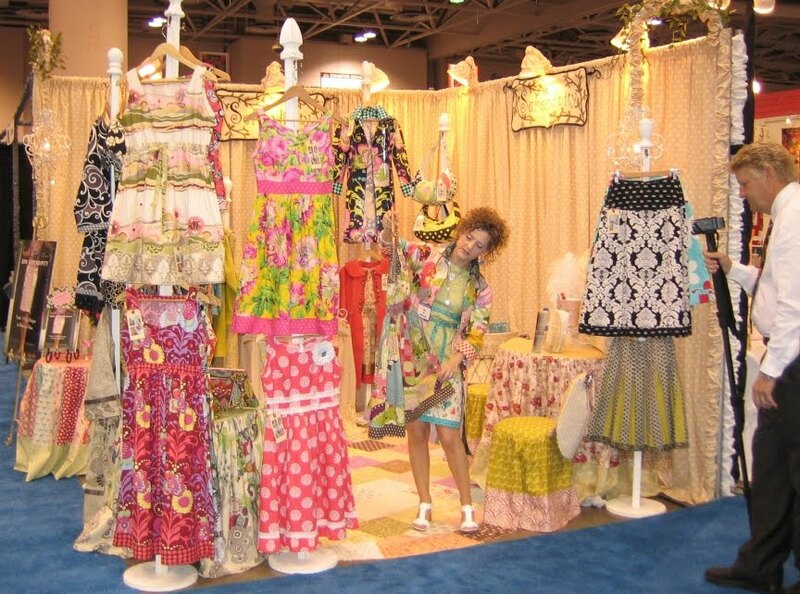 They are all wearing variations of my Emaline Skirt. Don't they look adorable? 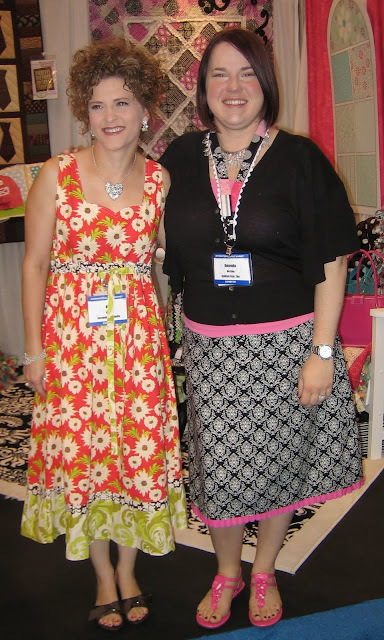 Here I am with Amanda Herring of the Quilted Fish. We first met at the Pittsburgh market last year and she is a delight, not to mention VERY talented! 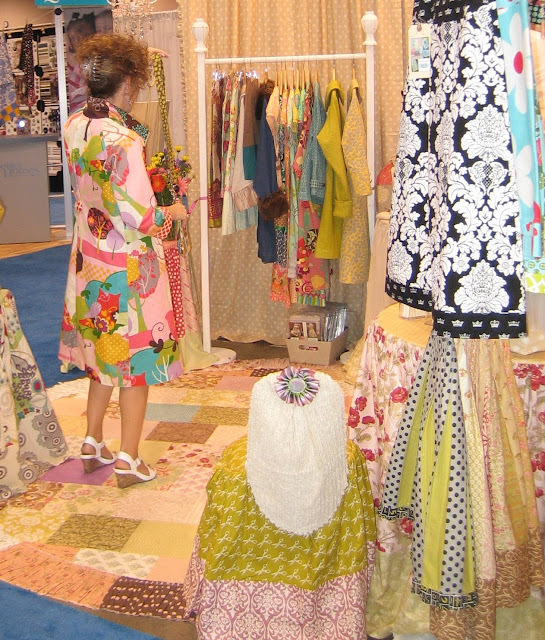 She has her first fabric line coming out with Riley Blake in the fall and it is fabulous. Be sure to check it out. She is also wearing the Emaline Skirt. 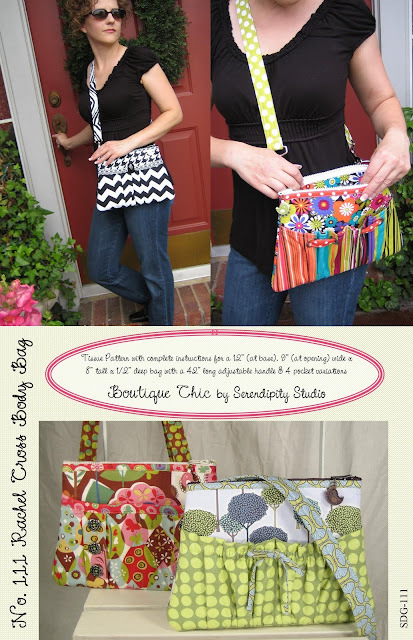 See how great it looks on the whole Quilted Fish crew! 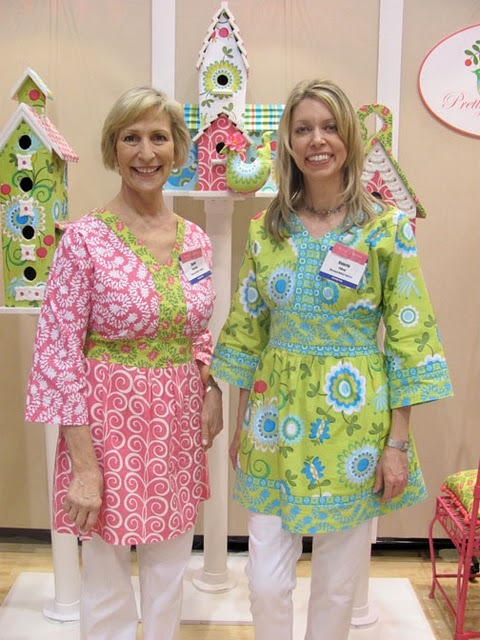 Here is Pillow & Maxfield wearing my Torii Tunic in their new fabrics for Michael Miller, Pretty Bird. Don't they look wonderful? 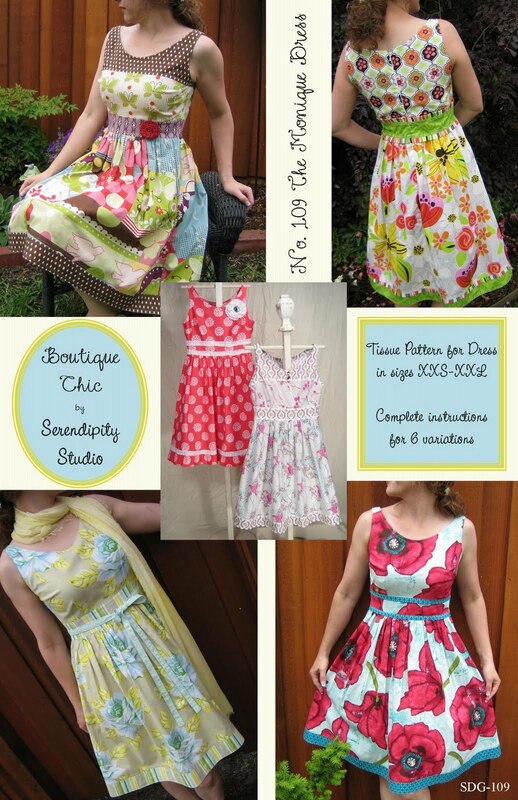 I just can't get over how fun it is to see my designs all over the place and know how much people enjoy them. It does my heart good, I tell you. 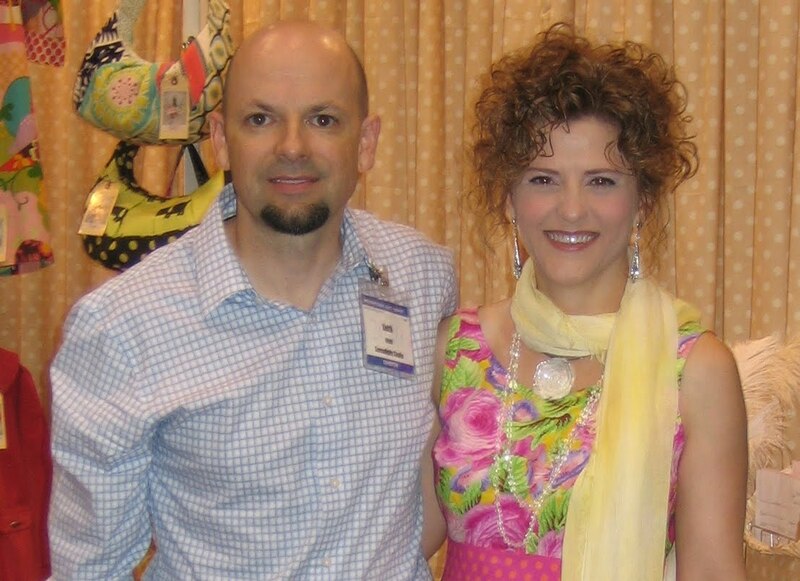 Last, but certainly not least, here is a photo of my husband Keith and me on the first day of market. This man is wonderful! You should hear (and some of you have) how well he knows the designs. He can talk the talk with the best of them and he does a great job with the orders at market while I am somewhere talking (usually in the aisle or running around when he lets me out of the booth!) None of this would be possible without all of his support. We will be celebrating 18 years of marriage here in a week or so...I am so glad to have him in my life. We make a great team!